The MESA 7I43 is a low cost, general purpose programmable I/O card that connects to the host computer via USB or PC parallel port. The 7I43 uses a 200K or 400K gate Xilinx FPGA for all logic, so it is truly an Anything I/O card. 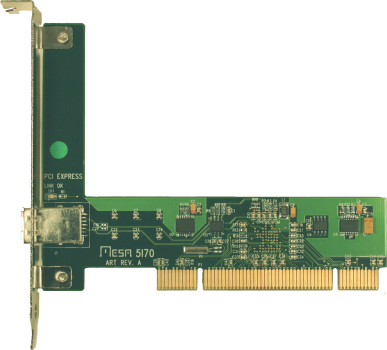 The FPGA is downloadable from the USB or Parallel port bus side, and also has the capability of local configuration storage in an on card EEPROM. Efficient switching regulators are used for FPGA core and 3.3V power, allowing the 7I43 to be USB bus powered. The 7I43 can also be powered by an external 5V source. A FTDI FT245R USB interface chip is used for the USB interface. Drivers are available for Windows and Linux. The drivers avaliable for the FT245R make the software interface a simple buffered byte stream. Parallel port bus interface uses EPP mode. A 50 MHz oscillator provides the FPGA clock. This clock can be multiplied or divided in the FPGA for other clock rates. The 7I43 has 48 I/O bits available on two 50 pin connectors. Both connectors use I/O module rack compatible pinouts. All I/O bits are 5V tolerant, and have series and parallel termination options (DCI). The I/O connectors are compatible with our 7 series daughter cards for isolated I/O, motion control and other applications. Configurations are provided for simple GPIO, Smart Motion control (SoftDMC), host based motion control (HostMot2), and a waveform generator. 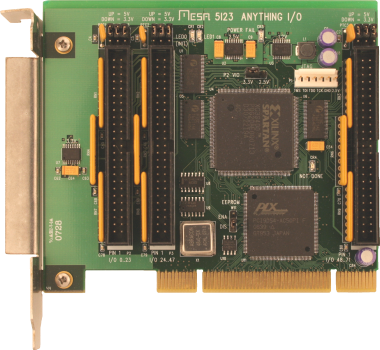 The MESA 5I20 is a general purpose programmable I/O card for the PCI bus. The 5I20 uses a 200K gate Xilinx FPGA for all logic, so it is truly an Anything I/O card. 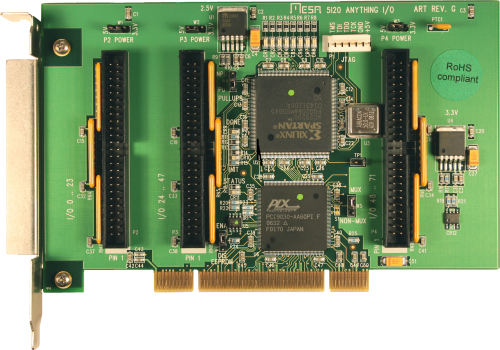 The FPGA is downloadable from the PCI bus side, allowing creation of almost any kind of specialized I/O function, even including micro-controllers in the FPGA. Several pre-made functions are provided, including a 12 channel host based servo motor controller, a 4 or 8 channel micro-controller based servo motor controller (micro-controller CPU built into FPGA), and a 8 channel, 32 bit timer counter card capable of running at 100 MHz. VHDL source is provided for all examples. All I/O bits are 5V tolerant and can sink 24 mA. Pullup resistors are provided for all pins so that they may be connected directly to opto-isolators, contacts etc. The 5I20 has 72 I/O bits available on three 50 pin connectors, all connectors use I/O module rack compatible pinouts. 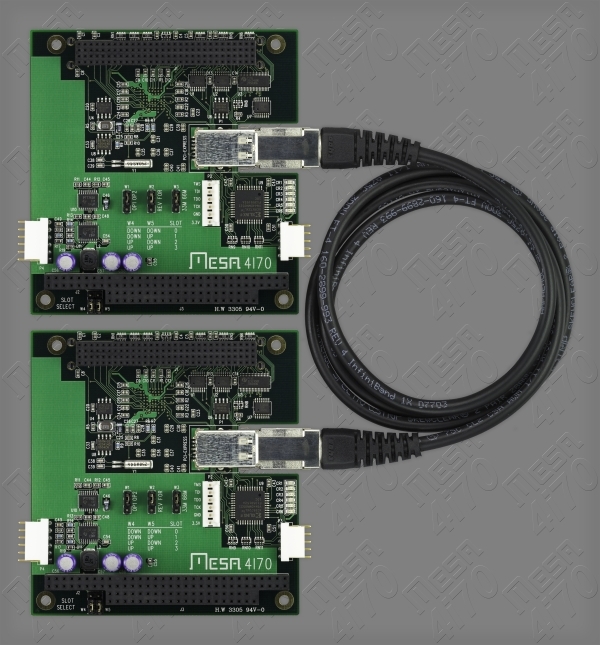 The MESA 5I21 is a programmable serial interface card for the PCI bus. The 5I21 is designed for applications using RS-422 and RS-485 interfaces. The 5I21 can support up to 12 full duplex RS-422 or half duplex RS-485 serial links with baud rates up to 10 M baud. The 5I21 uses a 400K gate Spartan3 FPGA and a bus mastering PCI bridge for high performance. Since all serial logic is FPGA based, almost any RS-422/RS485 protocol can be supported. The I/O connector is a 68 pin high density type compatible with standard 100 ohm differential cables. On card serial line termination includes idle line pullups and pulldowns to guarantee a valid undriven input state. The 5I21 is suitable for high performance motion control systems, Industrial I/O, Custom real time distributed I/O, time code generation, supporting legacy hardware, and almost any high speed serial interface application that requires a flexible, high performance, universal serial interface card. The 7I60 is a standalone (no bus) version of the FPGA based Anything I/O card series. It provides 96 I/O bits and 4 serial ports. There are 2 RS-232 ports and 2 RS- 485 ports. One of the RS-232 serial ports is used for downloading initial configurations to the on-card Flash EEPROM for FPGA configuration, the other ports can be used for any purpose. The 96 I/O bits are available on four 50 pin connectors, 24 bits per connector. The 50 pin connectors have I/O module rack compatible pinouts. The connector pinout uses interleaved grounds for lower crosstalk and controlled impedance. Socketed pull-up resistor networks (or optional termination networks) are provided for all I/O bits. PwrGood, Done, Init and status LEDs are provided for debugging puposes as are 8 FPGA driven LEDs and a FPGA driven beeper. Several I/O interface daughter cards are available for the 7I60. These cards include a 4 axis 3A Hbridge, a 2 Axis 3A stepper motor driver, an analog servo amp. interface, an RS-422/485 interface, and a debug LED card. 2 daughter cards can plug directly onto the 7I60. Many IO configuration files are provided with the 7I60 including simple remote I/O, smart remote I/O, 4 and 8 axis servo motion control, 4 and 8 axis microstepping stepper motor control, multiple channel PWM generator, quadrature counters and more. VHDL source is provided for all configurations. 2 FPGA system clocks are provided: a 50MHZ Crystal and a 25, 33, 50, 66, 80 MHz PLL. 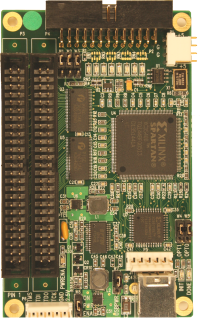 The 7I60 uses a 200K gate Xilinx SpartanII FPGA. Free development tools for The SpartanII are available (Xilinx WebPack) from Xilinx s web site. 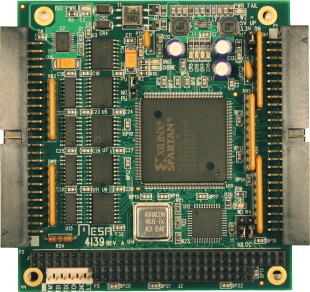 The MESA 4I24H is a 96 bit parallel I/O interface implemented on the PC/104 bus. The 4I24H is functionally the same as the 4I24 but has outputs capable of driving 24 mA. CPLD devices are used to emulate the 82C55s used on the 4I24. The CPLD support all mode 0 82C55 operations. 3K Pullup resistors are provided on all ports to simplify interfacing to contact closure, opto-isolators, etc. 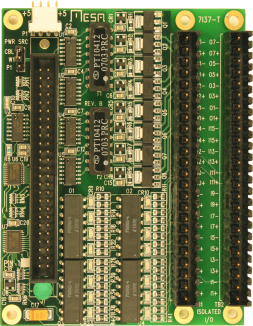 The standard 4I24H uses two 50 pin headers for I/O connections. The 50 pin connectors each have 48 I/O bits, ground, and power. Four layer circuit card construction is used to minimize radiated EMI and provide optimum ground and power integrity. The 5I70 is a PCI to one lane PCI Express bridge on a standard PCI card. The 5I70 can be used in conjunction with the 4I70 in order to access PC/104-PLUS peripheral cards up to 15 Meters from a standard desktop PC. The 5I70 uses a one lane Infiniband cable to connect between the 5I70 and the remote card. The MESA 4I39 is a general purpose programmable I/O card for the PC/104 bus. The 4I39 uses a 200K gate Xilinx FPGA for all logic, so it is truly an Anything I/O card. The 4I39 is designed for RS-422 applications and provides 8 full duplex isolated RS-422 interfaces. Each interface is capable of 10 Mb per second communication. The FPGA configuration is downloaded from the PC/104 bus interface. In addition to the RS-422 I/O, 24 5V tolerant TTL I/O lines are provided via a 50 pin connector with I/O module rack compatible pinout. The 4I39 is useful for motion control systems, interfacing SSI type encoders, as a general purpose high speed serial interface card, interfacing legacy hardware and devices with proprietary protocols. The MESA 4I65 is a general purpose programmable I/O card for the PC/104-PLUS bus. The 4I65 uses a 200K gate Xilinx FPGA for all logic, so it is truly an Anything I/O card. 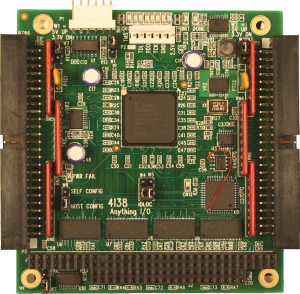 The FPGA is downloadable from the PC/104-PLUS bus side, allowing creation of almost any kind of specialized I/O function, even including micro-controllers in the FPGA. Several pre-made functions are provided, including a 12 channel host based servo motor controller, a 4 or 8 channel micro-controller based servo motor controller (SoftDMC), and a 8 channel, 32 bit timer counter card capable of running at 100 MHz. VHDL source is provided for all examples. All I/O bits are 5V tolerant and can sink 24 mA. Pullup resistors are provided for all pins so that they may be connected directly to opto-isolators, contacts etc. 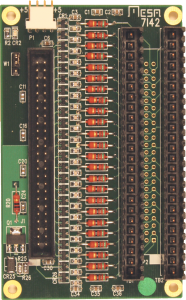 The 4I65 has 72 I/O bits available on three 50 pin connectors, all connectors use I/O module rack compatible pinouts. Several I/O interface daughter cards are available for the 4I65. These cards include a 4 axis 3A Hbridge, a 2 Axis 3A stepper motor driver, an analog servo amp. interface, an RS-422/485 interface, and a debug LED card. 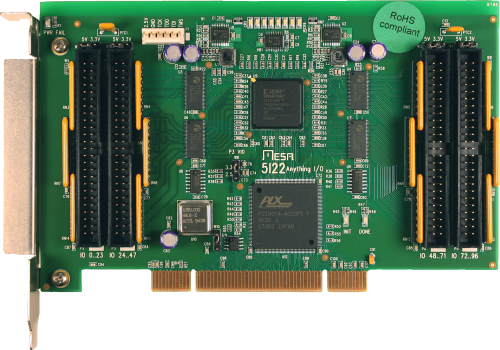 The MESA 4I68 is a general purpose programmable I/O card for the PCI bus. The 4I68 uses a 400K gate Xilinx Spartan3 FPGA for all logic, so it is truly an Anything I/O card. The FPGA configuration is downloadable from the PCI bus side, allowing creation of almost any kind of specialized I/O function. The 4I68 uses a bus mastering PCI bridge to give the card the ability to work with both 5V and 3.3V PCI buses and support high FPGA/PCI bus transfer rates. Several pre-made functions are provided, including a 12 axis host based servo motor controller, a 24 channel quadrature counter, an 8 axis micro-controller based servo motor controller (SoftDMC), a simple 72 bit parallel I/O port, and a 12 channel, 32 bit timer counter card capable of running at 100 MHz. VHDL source is provided for all functions. The 4I68 uses three 50 pin connectors with I/O module rack compatible pin-outs and interleaved grounds. Two of the connectors support single ended 3.3V signals. One connector supports 3.3V or 2.5V signals and LVDS. DCI termination is supported on all I/O pins. Each connector provides 24 I/O bits for a total of 72 programmable I/O bits. A 50 Mhz crystal oscillator provides a reference clock which can be multiplied by the FPGAs DLLs for higher clock speeds. Several I/O interface daughter cards are available for the 4I68. These cards include a 4 axis 3A Hbridge, a 2 Axis 3A stepper motor driver, an analog servo amp. interface, an RS-422/485 interface, and a debug LED card. 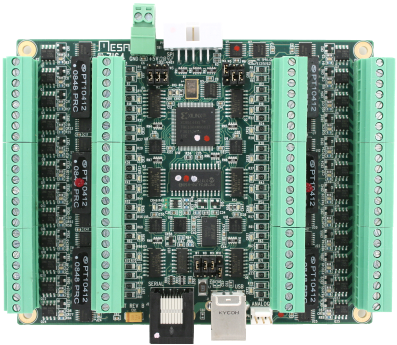 The 7I34 is a 8 channel RS-422 interface for Mesa s Anything I/O series of FPGA interface cards. The 7I34 has 8 independent receive and transmit channels. Each transmit channel has a independent drive enable for bus or 2 wire half duplex systems. The controller connection is a 50 pin header that matches the pinout or the 4I34M, 4I38, 4I65, 4I68, 5I20, 5I22, 5I23, 7I43 and 7I60 Anything I/O cards. Another 50 pin header is used for RS-422 connections. The 7I34 has an assembly option for receive only applications. This model (7I34-R) has 16 RS-422 inputs but no outputs .Another assembly option (7I34-485) replaces the drivers with RS-485 compatible chips. The 7I34 can be used with an Anything I/O card for multiple channel RS-422 serial interfaces, encoder interfaces, and many other industrial applications. 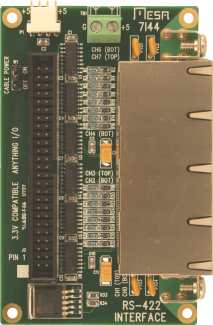 The 7I44 is a 8 channel RS-422 interface for Mesa s Anything I/O series of FPGA interface cards. The 7I44 has 8 independent receive and transmit channels. Each transmit channel has a independent drive enable for bus or 2 wire half duplex systems. The controller connection is a 50 pin header that matches the pinout or the 4I34M, 4I38, 4I65, 4I68, 5I20, 5I22, 5I23, 7I43 and 7I60 Anything I/O cards. Serial I/O connectors are RJ45 jacks allowing standard CAT5 cables to be used for high speed serial links. The 7I44 also supplies 5V power on the RJ 45 connectors. PTC devices limit maximum 5V current to 1A . The pinout used is compatible with Mesa's 3C20 motion controller and the 8I20, 8I21 serially connected amplifiers. The 7I37 is an 8 output, 16 input isolated I/O card. The 7I37 provides 8 Isolated 48VDC 1A output drivers. All output drivers are low saturation voltage MOSFETS for low power dissipation. Each of the 8 output switches is isolated from the others, allowing high side, low side, push-pull and other output switch configurations. The 16 opto isolated inputs will operate with input voltages from 5 to 24 V. Reverse protection diodes are provided to allow use with AC inputs. The 7I37 is compatible with the 4I24M, 4I24H, 4I34M, 4I38, 4I65, 4I68, 5I20, 5I22, 5I23, 7I43 and 7I60 I/O cards. The 7I37T version replaces the 50 pin header output connector with 3.5mm headers compatible with pluggable screw terminal blocks. Two TB24 pluggable terminal blocks are required for use with the 7I37T (not included). 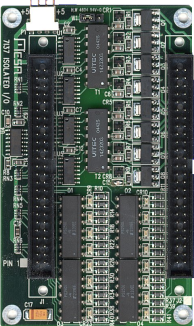 The 7I64 is an 24 output, 24 input isolated I/O card. The 7I64 provides 24 isolated 48VDC 2.5A output drivers. All output drivers are low saturation voltage MOSFETS for low power dissipation. Each of the 24 output switches is isolated from the others, allowing high side, low side, push-pull and other output switch configurations. A built in watchdog timer turns all outputs off if the 7I64 is not accessed within a selectable watchdog timeout interval. The 24 opto isolated inputs will operate with input voltages from 5 to 24 V. Reverse protection diodes are provided to allow use with AC inputs. The 7I64 has three host interface methods, USB, Serial RS-422 and SPI. The 7I64 can be USB powered. The serial interface supports baud rates from 115.2 K baud to 2.5 M baud. The SPI interface is compatible with MESAs Anything I/O cards and support high speed real time I/O. A SPI breakout card (7I46) allows up to six 7I64s to connect to a single 50 pin Anything I/O connector. The SPI interface supports data rates to 8 Mbps so a full read/write of all 48 I/O bits takes approximately 4 uSec. 3.5 mm screw pluggable screw terminals are used for all isolated I/O. The 7I42 is a breakout card for Mesa's 50 pin I/O FPGA cards. It is available with 50 pin .1" output connector (7I42) or 3.5mm headers compatible with pluggable screw terminal blocks (7I42T). In addition to providing a breakout function, the 7I42 protects the FPGA card from excessive input voltages and ESD. The 7I42 protects FPGA I/O from accidental contact from external voltages of +12 and -5V with built in diode clamps and 50 Ohm current limit resistors in series with all I/O pins. The 7I42 limits I/O pin bandwidth to approximately 10 MHz. Two TB24 pluggable terminal blocks are required for use with the 7I42T (not included). 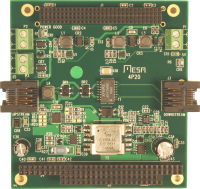 The MESA ISIO is a low cost isolated I/O card that is driven from a standard printer port. The ISIO has 4 relay or 4 transistor outputs and 8 opto-isolated inputs. Relay outputs are rated at 2A, 24VDC or 1A, 120VAC. Transistor outputs are rated at 1A, 48VDC. Inputs are 10 to 48VDC. All isolated I/O uses screw terminals. Outputs are disabled at powerup until a specific 12 bit code is sent to the ISIO. This prevents inadvertant output activation during power-up. Up to 4 ISIO modules can share a single printer port. ISIO outputs can be latched so that accessing other ISIO modules on a shared port does not effect the output state . The ISIO uses a PC/104 compatible form factor but does not use the PC/104 bus. Since it uses the parallel port, the ISIO can be located as far as 10 feet from the controlling CPU.